Lore Raymond: A New Way to Celebrate World Gratitude Day! A New Way to Celebrate World Gratitude Day! Much is written about the value of giving thanks and writing a gratitude list. To celebrate World Gratitude Day here's something new to add to your spiritual toolkit: Writing an AAA List--or an Always in Advance Appreciation List. Like the business of AAA, the American Automobile Association, you might visit their office to get one of their "trip-tics." You tell them where you want to go and they assemble a packet of maps to guide you to your destination. The guessing and worry of arriving there safely and successfully are eliminated with this helpful information. The AAA List applies the same principles. At the start of each day, perhaps after your prayer and meditation time, first tell Source where you want to go--but never how! Allow miracles to unfold for you in ways you could never imagine. Next, in the sacred silence, visualize your day by mentally walking through it from the morning to that important phone call, next to that writing assignment, and finally to that healthy recipe you want to try for dinner. * Peace and love expressing through me as me. I write AMEN at the end of my AAA List to seal it with love. The next morning to start my Divine Dialogue Writing practice, I review this list. It prompts me with ideas to now write my new Gratitude List--both practices are my bookends of gratitude for each day. 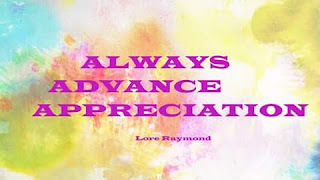 What are you always appreciating in advance? Thank your for your reply in the comments below and sharing to celebrate World Gratitude Day! Why not visit me at http://www.LoreRaymond.com? Not a list gal, but yours makes so much sense to me today, Lore. This is a day when I need inspiration to embrace inner peace and focus, so I will write my list right now! <3 All my love! What a great idea! Thanking the universe in advance for all it's gifts, brilliant! Ahh, thanks for your kind words, Rachel! As I said above, I'm finding that by writing this AAA LIS at least 80-90% happens! What a great idea! I'll have to give that a try! Happy you like this idea, Barb. IT DOES WORK in attracting what you seek...and so simple to do. Yeah! Looking forward to connecting, Patricia. Thanks mycdear friend❤ happy that the idea might serve your already strong gratitude practice. I like your triple A list. It's very creative and easy to do. I always recommend appreciation to everyone. Appreciation is the fastest way to calm our mind which ion turn allows us to connect to our soul. Priceless. Just now i read your whole information attentively then i know about a new way to celebrate world gratitude day. Thanks to 24Biz Company because they recommended me this website. I will visit this website again for more info. It is startling to surmise that you and your family may not really be eating as sound as you think, and that is the reason I feel that it is vital to comprehend what items are really solid for you and which items are really not. Thousands of health club members from around the world can watch your video. This choice is one that you should consider, if your child or girl is enlisted in a school far from home.